Verity Knit Top https://www.review-australia.com/au/verity-knit-top-blue-shimmer/RE19KW069.REPNK113.html Add a twinkling of glitter to your knitwear with this Verity Knit Top. Designed with a contrast black button and collar appliqu? against a pale pink background and fitted with single keyhole closure at the back. The kind of piece which can be worn with slim fit jeans for the day-time and then swapped for an A-line skirt for the evening. Verity Knit Top is rated 4.8 out of 5 by 9. Rated 5 out of 5 by A Review Girl from Pretty & Dainty I bought the Verity Knit Top also with the FRANKIE KNITTED SKIRT as soon I saw them on line both are lovely together the top is a very light weight the actual bow itself is printed into the fabric you would have to be careful not to catch your jewellery on the top as it’s very dainty, it will also go with many of my other Review skirts & pants . Rated 4 out of 5 by Reviewer from Smart and Comfortable This is a really great little top. 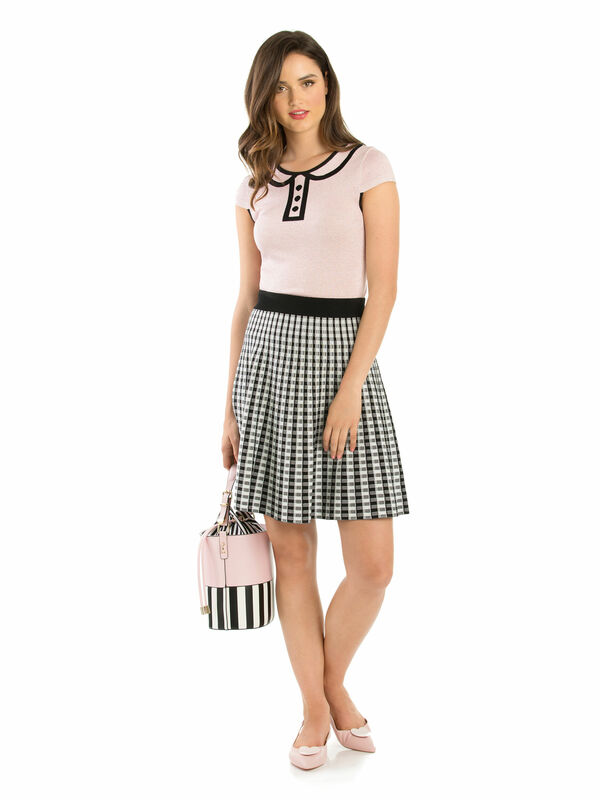 It's a really comfortable knit and looks very smart teamed with the Frankie skirt (which I also bought). I also like the modest neckline for the workplace. Pretty, feminine and flattering! Rated 5 out of 5 by Tanya P from Beautifully made , gives a bit of sparkle This top is just lovely - it has a sparkle to it that is not apparent in the pics . Can’t wait to wear it ! Rated 4 out of 5 by Coastal_love_styling from Sparkles and Glitter. A girls best friend. The ultimate in girly girls dream tops. It’s Pink and it sparkles. What more could a girl want in a knit. Rated 5 out of 5 by FlowerTime from Beautiful top! I love this top! I receive so many compliments every time I wear it. It's very pretty. Rated 5 out of 5 by NicoleLisa72 from Pretty pink and sparkly Photos don’t do it justice, this top is a lot prettier and sparkly in real life.